Michael has now been offically announced as host of this year's BBC Proms in the Park, taking place on 14 September in Hyde Park, London. The show will be broadcast live on BBC Radio 2 and please bear in mind that this also means, he will not be appearing in Les Miserables on 13 September (rehearsals) and there is no performance of Les Mis on 14 September. Tickets go on sale on 11 May and will cost 45 Pounds. Thanks to Mark for the heads-up! You will be able to get them here. In tour related news, Michael will not only braodcast his Sunday radio show live from BBC York this week but he will also pop by Neil Foster to chat all things tour in his show at 3pm. Listen here. Michael has recorded the duet A Million Dreams with Susan Boyle for her upcoming album Ten. The album will be released on 31 May 2019. You can listen to a snipet of it here and pre-order the album here. Today was meant to be a historic day one way or another: Michael's latest solo album Coming Home to You officially head the UK album charts! It's his first solo album to reach the top spot after 27 years (his very first album did, too). Naturally the two albums with Alfie have also reached number 1 in the charts. This is extra special though, 4 self-written songs, 1 song written for him - his most personal album yet. 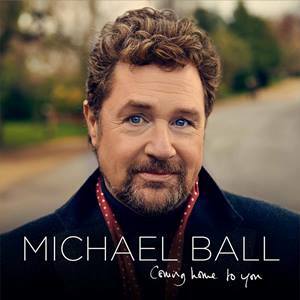 Fabulous news about "Coming Home To You": It hit the coveted #1 spot in the midweek charts. What does this mean? It's not (yet) the end of the first week of it's release. Those charts will be determined on Friday, but they publish midweeks, which do, what it says on the tin. Within the midweeks Michael is at no 1 and with a good chance to keep that space until the end of the week. It always helps to give him a push. So, if you still need a good present, get this album another time and support him. Michael will be interviewed on the One Show tonight at 7pm. Be sure to tune in to BBC One tonight. He will be talking about the album, the tour and he will be performing "All Dance Together" for the first time in front of a live audience. Should you happen to live in London or be around in the vicinity, Michael invites you to come to the BBC Broadcasting Center and watch him there. For more information on The One Show click here. Today, 16 March, he will be a guest on Loose Ends, BBC Radio 4, 6:15pm. Michael will also be performing live in Ken Bruce's piano room: Tuesday, 26 March from 9:30am. On 31 March, his interview with Radio Solent's Lou Hannon for her Showstoppers programme at 6pm. 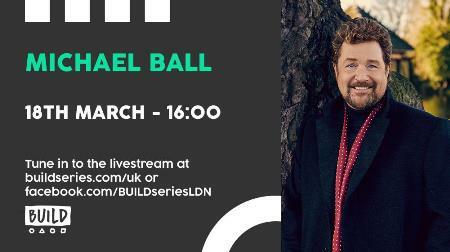 On Monday, 18 March, Michael will be appearing on the BUILD series. You can get tickets here. The show will be live streamed here. Also remember, his recorded appearance on ITV's Loose Women will air on Good Friday, 19 April at 12:30noon. It was announced today that Michael and Alfie will headline the Hampton Court Festival this summer. They will close the festival on 22 June. Enjoy the dynamic duo and festive fireworks. Tickets will go on general sale on Thursday, 14 March and can be bought here. Michael is all over the media these days, several radio and TV interviews were aired today or will in the next couple of days, too many to keep track! You can listen again to Eleri Sion as just one example, but it's worth to keep your eyes and ears peeled for more appearances. On Saturday, 9 March Michael is a judge for the Scruffts at the Crufts in Birmingham. This will be broadcast on Channel 4 at 7pm. 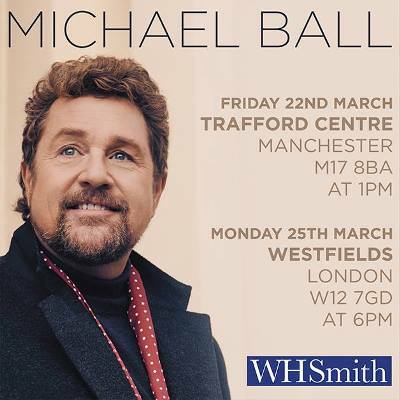 On Friday, 22 March he will be at Manchester Trafford Centre from 1-2pm. Get your ticket (price includes album) here. On Monday, 25 March you can see him at Westfield London Shopping Centre from 6-9pm. On Monday, 4 March Michael will be a guest on Radio Wave 105 from 5pm and on ITV's Meridian News from 6pm. On Tuesday, 5 March he will appear on ITV's Central News from 6pm. He will also be a guest on ITV's Loose Women on Good Friday (19 April) at 12:30noon. On Monday, 11 February Michael will be a guest at BBC Radio 2's Steve Wright in the Afternoon. Tune in from 2pm. You can now download the new single Home To You from the new album. Choose your preferred service here. Or you could order a signed copy of Coming Home to You here. Tomorrow on 8 February Michael will once more co-host BBC One's The One Show. Tune in from 7pm. And remember he will also be on Lorraine in the morning. 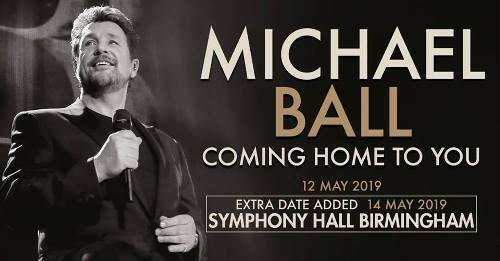 Michael will NOT be appearing in performances on 13 September and 14 September (he'll be busy with Proms in the Park). Also John Owen-Jones will be performing the role of Jean Valjean on Mondays, Wednesday matinees and Thursday evenings. Tomorrow on 7 February Michael will be a guest on ITV's Lorraine. Tune in from 8:30am. 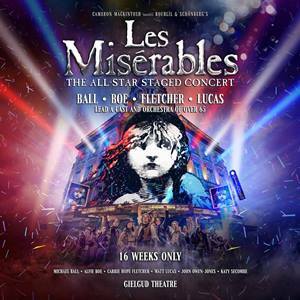 For 16 weeks only Michael Ball (Javert), Alfie Boe (Jean Valjean), Carrie Hope Fletcher (Fantine) and Matt Lucas (Thenardier) will lead a large cast and orchestra of over sixty-five in the concert version of Les Miserables. Katy Secombe also joins to play Madame Thenardier and for three performances a week, the role of Jean Valjean will be played by John Owen-Jones. Further casting will be announced shortly. 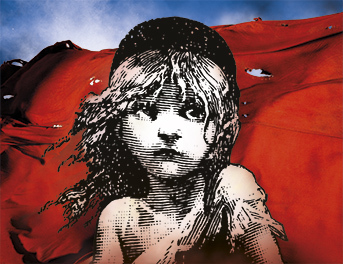 This spectacular staging of the legendary concert, previously seen in London at the Royal Albert Hall and the O2 Arena, will run from 10 August - 30 November 2019 at the intimate Gielgud Theatre next door to the current home of Les Miserables at the Queen's Theatre. No booking link has been provided yet, but the Les Mis Facebook account informed people they expect tickets to go on sale via Delfont Mackintosh. Tune into Radio 2 tomorrow! The promotion for the new album has well and truly started. On 11 January 2019 Michael will be hosting The One Show again (BBC One, 7pm). On 25 December 2018 Michael will once again be hosting a show for Radio Wales. Tune in to Michael Ball and Festive Friends at 12 noon on BBC Radio Wales: Read more about it here. 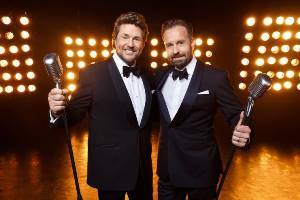 Also An Evening With Michael Ball and Don Black will be aired on 30 December 2018 at 7pm. Read more about it here. Due to popular demand, a second tour concert at the Birmingham Symphony Hall has been added to the schedule. Tickets are on sale now for Tuesday, 14 May 2019: book here. Today, Friday, 14 December 2018, Michael will be on BBC Two's Stirtcly - It Takes Two. So tune in at 6pm. Due to popular demand, a second tour concert at the London Palladium has been added to the schedule. Tickets are on sale now for Wednesday, 1 May 2019: book here. Tomorrow, on Tuesday, 4 December 2018, Michael will appear on ITV's This Morning. So tune in at 10:30am. The news we were all waiting for! 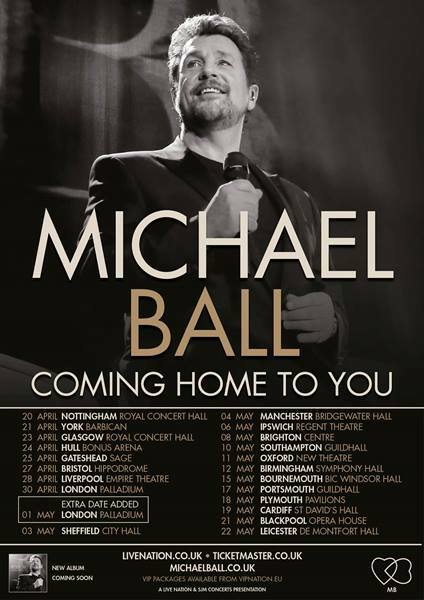 Michael's new album will be called Coming Home to You and is released on 22 March 2019. Let's all make sure it's a massive success by pre-ordering here. But that's not all: he will also tour the UK with the new album in April and May 2019! Tickets go on general sale on Friday, 7 December 2018 and you can get an overview here. We hope to see many of you on the road. On Wednesday, 26 December 2018, BBC Radio 4 will broadcast their comedy drama Lena Marsh, Live And Shticking! with Michael playing (reading) himself. Well worth to listen out for at 2:15pm. Read all about it here. It has also just been announced that on 14 July 2019 (Sunday) Michael and Sheridan Smith will close the Lytham Proms with their "Hollywood Proms" finale. Tickets are on sale on Friday 30 November and you can book and read all about it this page. Just when Kerstin and I get ready to leave for London (and the Michael Ball Show live from the Savoy), it was announced that he will once more be co-hosting The One Show. So tune in tomorrow, 14 November 2018 at 7pm, BBC One. Today, 2 November 2018 Michael will once again be co-hosting BBC's The One Show. Tune in at 7pm, BBC One. On Friday, 12 October 2018 Michael will once more be co-hosting BBC's The One Show. Tune in at 7pm, BBC One. On Tuesday, 23 October 2018, BBC Radio 2 marks the 80th birthday of Don Black with a special show at the BBC Radio Theatre. Michael Ball Presents: An Evening With Don Black sees Don take to the stage in conversation with Michael, sharing his thoughts on his life and career. Tickets will be allocated at random and you can apply at the end of this page. 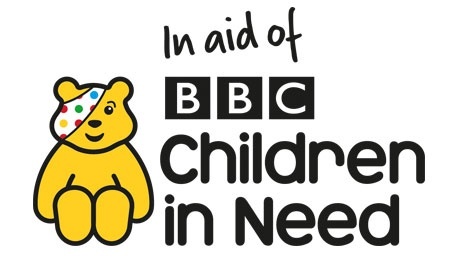 On Sunday, 18 November 2018, Michael's BBC Radio 2 show will be broadcast live from the Savoy Hotel in London.He'll also be hosting the Children in Need Lunch afterwards from 2pm. He will be joined by many star guests and you can buy tickets for this event in aid of Children in Need here. Read more about this special day here. Michael will be one of the performers in a gala concert celebrating the ENO's anniversary. The event is scheduled for Wednesday, 10 October. Mark Witchell kindly gathered all the information on the Proms coverage. A huge thank you for that! Michael will co-host BBC One'sThe One Show together with Alex Jones this Friday (3 August). Tune in at 7pm. Michael will co-host ITV'sThis Morning together with Sarah Cox this Friday (27 July). Tune in at 10:30am. 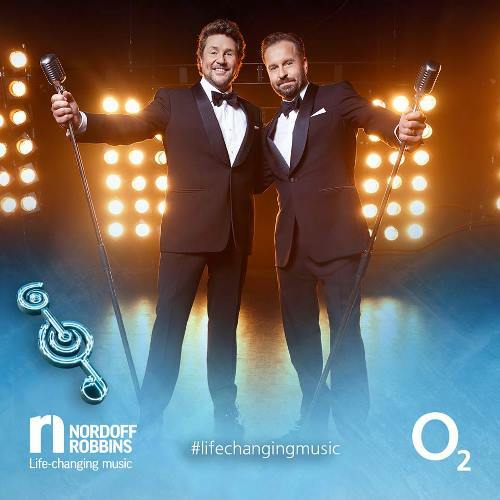 It has been announced today that Michael and Alfie have also won the PPL Classical Award at the O2 Sliver Clef Awards! The ceremony will be held on Friday, 6 July at the Grosvenor House Hotel on Park Lane. You can read all about it here. They did it! 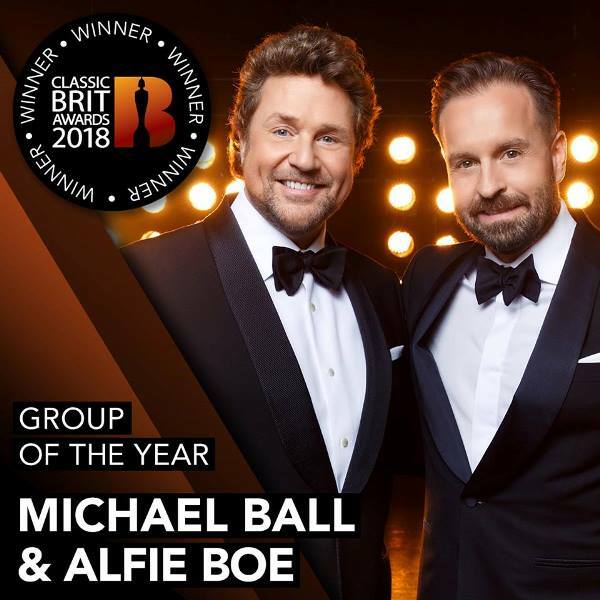 Ball and Boe have just won two Classic BRIT Awards: Group of the Year (Michael:"We're a boyband, it's offical!") and Album of the Year! Congratulations to the dynamic duo! What a well deserved honour. You can watch the ceremony on ITV1 (Sunday, 17 June, 10:30pm) and (hopefully) see Michael snogging Alfie, as promised on Twitter. Tomorrow, 12 June, Michael will be a guest on ITV's Good Morning Britain, so tune in at about 8:20am (the show starts at 6am). Due to a technical glitch we have lost our news items from end of March through April. The most important of thise surely was the double nomination for Ball & Boe for the Classic BRIT Awards. On 2 May Ball and Boe were nominated for two Classic BRIT Awards (Group of the Year and Album of the Year for Together Again). They will also perform at the ceremony on 13 June at the Royal Albert Hall. You can still get tickets for the ceremony here. BB will be singing the West Side Story Medley. You, the public, can vote for the album of the year until midnight tonight (8 June) - and Michael promised to snog Alfie on stage at the RAH if it happens, so get voting everyone! Here is the link. And last but not least, ITV1 will broadcast the event on Sunday 17 June between 10.30pm and 12.15am. We also seem to have lost all the information regarding the Proms in the Park. On 8 September Michael will once again host the BBC Proms in the Park in Hyde Park, London (5pm). You can still book tickets for the eventhere. There will be live coverage on BBC Radio 2, as well as edited highlights on the BBC Red Button. 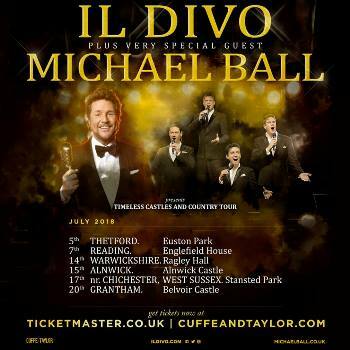 It's been announced today that Michael will be joining Il Divo for six of their Castles and Summer Houses tour in the UK as a very special guest. 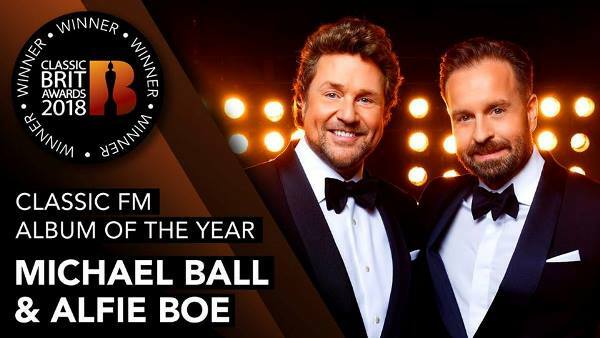 Congratulations also go to @mrmichaelball! Congratulations! This makes Michael's show one of the most popular broadcasts of the station. On Saturday, 14 April Michael will be interviewed on Graham Norton's BBC Radio 2 show between 10am and 1pm. 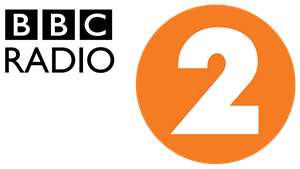 On Tuesday, 13 March Michael will be interviewed on Steve Wright in the Afternoon between 2 and 5pm on BBC Radio 2. And on Monday, 26 March Michael will be one of the guests on ITV's Loose Women between 12:30 and 1:30pm. On Saturday, 3 March Michael and Alfie will be guests on Ant & Dec's Saturday Night Takeaway in their End of the Show Show. It will be aired at 7:00pm on ITV. On Friday, 9 March Michael will once more be the co-host of BBC One's The One Show (7pm). And finally on Sunday, 11 March Michael and Alfie will appear with two songs onSir Bruce: A Celebration on BBC One. No air time known as yet. I know it's possibly been the worst kept secret in showbiz but I'm so happy to confirm I'll be playing Anatoly in Chess at the London Coliseum starting April 26th. 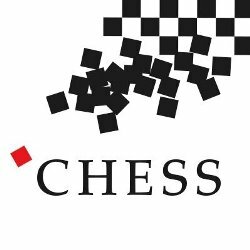 The first West End production of Chess since 1986 is to star Michael Ball, Alexandra Burke, Murray Head, Tim Howar and Cassidy Janson. This epic musical love story will open at the London Coliseum on Thursday 26 April 2018 for a strictly limited 5 week season. And - more importantly - book your tickets here. There is also the official Twitter account. On Friday, 9 February Michael and Alfie will appear on telly in Japan to promote their album and concerts. It will be on NHK between 8:15am and 9:55am local time, 11.15pm-12.55am UK time (on Thursday 8th February). And on Tuesday, 27 February Michael's appearance on Sky Arts 'Portrait Artist of the Year' will air between 8pm-9pm. Many thanks to Mark Witchell for keeping us up to date!